Gift guides are my favourite way to search for presents when I'm completely and utterly out of ideas. They do just what they're designed to and I think they're brilliant. It's fun seeing how different people assemble their gift guides and what their suggestions are. I love making them too in hopes that I can help someone the way other bloggers help me. I often make my guides quite generic and ensure that I'm not steering you just to think about gifting the things I've listed but also to find similar alternatives to the suggested gift. I really hope you like the guides and find something for that one person you're stuck on. 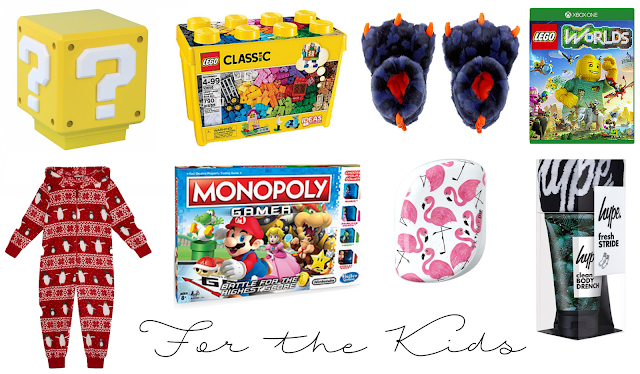 Now, on to the gift guides for her, for him and for the kids! I always find it easier to buy for the women in my life. 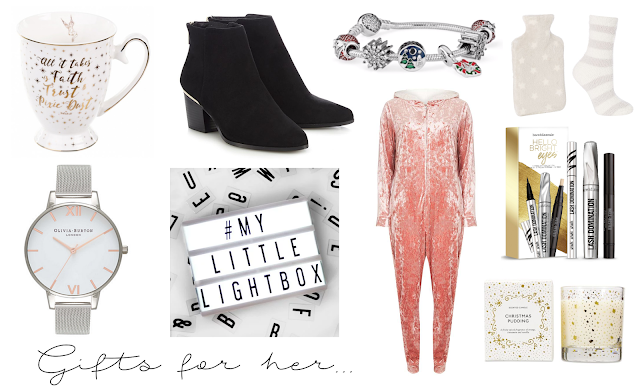 I'm not saying we all want the same thing but the women in my life are quite like me so I know they enjoy a pamper, some beauty products, comfort and things that are generally quite pretty and useful like the light box, candles and mug. Like I mentioned before these gifts are quite generic but they are all equally great gifts with some fantastic alternatives. If you're not into the velvet onesies then maybe a fleecy one (I'd prefer fleece). Analog watches not what you're after? Maybe a digital Casio or something with a bit more functionality like a Fitbit. And there are so many shoes and boots out there to choose from... I'd adore anything in this guide for her and I hope it can help you with some ideas. Unlike the women in my life, I find it extremely difficult to buy for my brothers, dad and boyfriend at times. 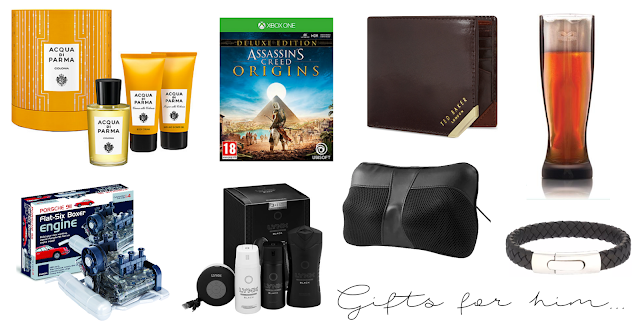 In my gift guide I've included the more 'safe' options but also some fun ones too. For those who sit at desks a lot, a massage cushion might be that pampering gift that he'd be thankful for. And for those who like to really concentrate on tasks, something like the DIY engine would be fun and so satisfying to complete. I always find the men in my life singing in the shower too so a shower speaker gift set would probably be great for any one of them. And I'm definitely after the Mighty Mug glass for someone this year. It doesn't tip over easy! Now this gift guide I tried to keep as unisex as possible. I was thinking about what kids in general would like, from those who might be just 5 years old, to those who are 15 and probably thinking about different gifts next year. A lot can change in 10 years but some things don't. Lego for example is huge at the moment. It doesn't matter whether you are 5 or 55, you can always enjoy Lego. Lego also have a humongous variety of Lego sets so there's no way you'd be lost for ideas in the Lego store. Even at almost 28, I enjoy a light box so I think it would be a great and useful gift for any kid. As long as it's in a style that piques their interest. Games are always a winner and with kids growing out of things so quickly, pyjamas and slippers are always in need - and fun to shop for. And finally for those who are hitting their teens and thinking about those different presents now, you can always introduce them to the more mature gifts slowly with some gift sets and essentials. I've got two in that zone to buy for so I'm finding it a bit hard. I hope they like the gifts I've bought them though. 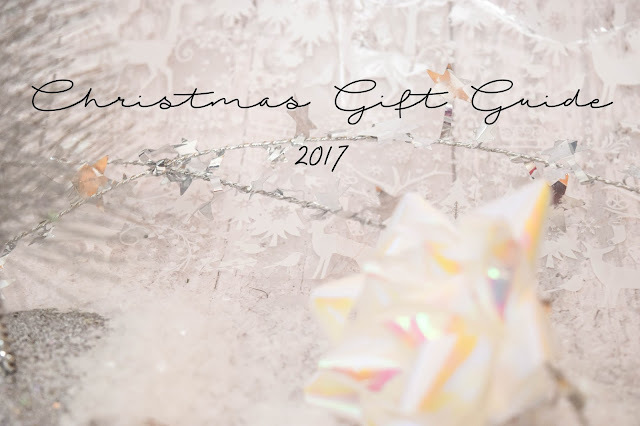 So those are my 3 gift guides for 2017. Let me know if you've had some light bulb moments reading this and browsing the gifts. I'd love to know if I helped!